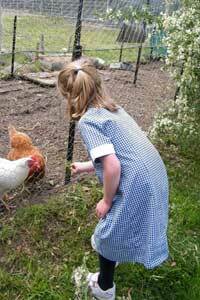 We recommend that children arrive between 8.45am and 8.55am each day. School begins at 9.00am. This allows time for morning routines and greeting friends and teachers. PLEASE NOTE: Teachers and support staff are often involved in meetings before 8.45am and are unable to supervise students before this time. Our school makes time every morning for a fruit break. Please send your child with a small piece of fruit. They must be able to manage it themselves, without the help of an adult, as the teachers continue their lessons while the students eat. As part of our health and physical education program the students participate in a 1⁄2 hour of daily exercise and physical skills development. Please make sure your child is dressed ap- propriately for the weather because we are mostly outside during this time. At school, we encourage students to have a healthy lunch. This promotes a healthy lifestyle and gives children the energy they need to learn. 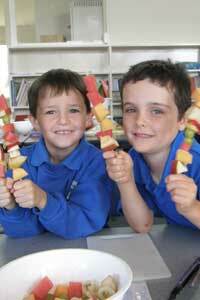 Lollies and soft drinks are not permitted at school. Students will eat lunch indoors. To minimise litter in the environment, no food packaging is allowed outside the room. Wednesdays are rubbish-free lunch days. As part of our promotion of environmental sus- tainability and litter reduction, we designate this day as one in which all food must be brought in reusable or recyclable containers. Fridays are hot lunch days. On this day, teachers are available to heat up (microwave or oven) lunch items brought from home. Ex. Pies, sausage rolls, pasta.